Citrus Fruits are also sometimes called acid fruits, have numerous curative benefits. Eat Citrus Fruits for Glowing Skin as they are rich in vitamin C and and potassium, have an acid flavor to varying degrees. The detoxifying properties of citrus fruits can work wonders to cleanse the body. Besides their delicious taste, these fruits also have a lot of health benefits. Not only are these fruits sodium free but they also contain low amount of fat and cholesterol.The first thing that comes to mind when we talk of vitamin C and its amazing benefits, is its prime source, citrus fruits. Vitamin C is still essential to health because it prevents scurvy and eating citrus fruits or drinking their juice is the most pleasant way of ensuring that the body has vitamin. Besides being replete with a huge quantity of vitamin C, it also contain potassium, niacin, thiamine, folate, fiber and various other nutrients that aid in the proper functioning of the body organs.The rich haul of vitamin C in citrus fruits strengthens the body’s disease fighting ability. Thus, if eaten daily, they can make wonders to heal the wounds and do not let harmful germs attack the body. Citrus fruits are covered in a thick rind, mainly white pith called the albedo, which has a thin colorful outer layer of zest or rind,where citrus oil and most of the vitamins are concentrated.tropical yellow and orange citrus varieties usually remains green even when ripe. Citrus Fruits can be eaten raw or they can be juiced. By taking these fruits, you can effectively prevent cough, cold and flu. There are various fruits that come under the category of citrus fruits, which include oranges, lemons, grapefruits, mandarins, pomelo, tangerine, lime, citron, kumquat, clementine etc. While orange can effectively fight against scurvy, which is caused mainly due to vitamin C deficiency, a lemon acts as a pain reliever and controls bee sting pain. Besides, it lower the chances of cardiovascular diseases.The property of citrus fruits to absorb iron can be an effective cure for anemic people. Those who consume these fruits on a daily basis are comparatively less prone to developing cataract. Pregnant ladies should also eat a lot of this type fruits. Citric acid present in citrus fruits kill bacteria and other pathogens present on the skin, leaving the skin fresh and clean. They occupy a special space in aromatherapy because of their fragrance. Let’s see some of the amazing health benefits of citrus fruits for skin, hair and health. Citrus fruits are also rich in antioxidants that remove the dead cells and bleaches the skin immediately to get rid of problems like tanning or acne marks. Using orange peels or lemon are the common example of homemade skin care recipes. It is because of the skin softening and new cells generating benefit of citrus fruits that these are used for skin care. Dehydration can make your skin look dull, so citrus fruit, such as lemon can refresh your face. Vitamin C gives a natural radiant looking skin. It hydrates and leaves the skin clear with regular usage. Instead of using commercial toners, use citrus fruit juice. Dab some of this juice on your skin daily to get a firm skin. This way your skin will be able to maintain its elasticity. Citrus fruits have again proved effective in <strong>reducing the size of acne pores</strong> and withdrawing its sebum and dirt in final combat. In case, you have dull and dry skin type, rub citrus fruits cubes on your skin and watch how your skin comes alive. In studies it has proved that those who consumed more Vitamin C appeared to have lesser wrinkles and skin dryness. Vitamin C plays an integral part in the growth and repair of body tissues. 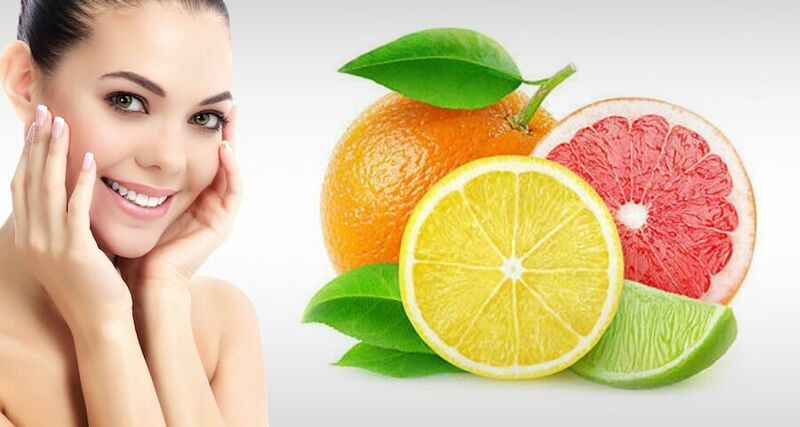 Consumption of citrus fruits delays wrinkles, discoloration, sagging and signs of aging in the skin. Those having brittle and weak nails should apply citrus fruit juice. This provides strength to your nails. It is because of the presence of vitamin C in it, which is responsible for nail growth and strength. Expensive products cannot nourish hair well, but delicious citrus fruits can provide the essential nutrients to your hair—giving you the hair of your dreams. Premature graying hair especially in teenage has become very common. In order to get rid of this, and <strong>restore your hair in true form</strong>, the usage of citrus fruits is considered very effective. Moreover, if baldness because of thinning hair is troubling you, usage of citrus fruits have help you overcome that too. Citrus fruit mask, consisting of grapefruit, lemon and orange, can work effectively for frizzy and dry hair. With regular application, this mask can heal damaged and dry hair to a large extent. You can also mix lemon juice in 3 parts of water and apply in to your scalp. Leave it for about half an hour and blow dry your hair. Citrus fruits, especially oranges, are known to lessen fall. Apply orange based hair masks to prevent this damage from happening. To get rid of dandruff, just rub some lemon juice on your scalp. Allow it to stay for about half an hour. Later, wash off with normal water. This is a sure shot remedy to treat dandruff woes. Further, it also helps in curing scalp itchiness. It is the high amount of antioxidant hat help the body counteract free radicals. With these antioxidants only, these are capable of preventing heart diseases also. Therefore, maintain regular intake of citrus fruits and prevent any kind of cardiovascular disorders like strokes, hypertension, and heart burn. Citrus fruits are regarded as a delicious way to fight weight gain. Citrus fruits contain flavonoid that prevent obesity and protects body from type 2 diabetes at the same time. The fruits are large or small with smooth thin or thick knobbly skin. Generally, plump lemons, heavy for their size and with smootyh oily skins, have less peel and more juise than large, knobbly skinned lemons. A small fruit, similar to lemon but rounder, and with green-yellow thin skin and tart yellow flesh. It may be substitued for lemon in cooking. It is much used in curry dishes but is more expensive than lemons. With a firm rough skin, oranges are juicy and slightly sour. Navel oranges are mainly grown in Italy and have a particularly rich flavour, reminiscent of berries. Another variety, the aromatic pineapple orange, is full of pips and is commercially used for juice. Blood Oranges have a dark red pulp and the skin may be veined with dark red. They are available from December to April. The Maltese orange, with seeds, is sour, very juicy, and has an exceptionally good flavour. Moro oranges, with a rough skin, are very juicy. Late oranges have pale flesh, few seeds, and come mainly from Spain and the southern hemisphere. Valencia oranges, with or without seeds, have smooth firm skins and are very sharp and juicy. Oranges are widely used in desserts, patisserie, and confectionery, for fruit salads, mousses, dessert creams, jams and marmalades. Oranges form the basis of an equally large range of drinks: syrups, sodas, juice, orangeade, punches, liqueurs and fruit wines. Mandarins are small, slightly flat, loose skinned oranges with a sweet taste. Perhaps the best known mandarin is the tangerine. The Japanese satsuma is a clementine(a bitter orange and tangerine cross) is bright orange red with a pebbled skin and tangy sweet flavour. Grapefruit are either white-fleshed with a yellow rind or pink fleshed with a pinkish blush to the rind. The two differ little in taste, which depends more on the presence of pips than on colour. Fruits with many pips have a pronounced flavour and are grown for canning, while the milder, pipless varieties are usually eaten fresh or in salads. The shaddock (also called pummelo or pomelo) is the largest citrus, resembling a large grapefruit with coarse, bittersweet dry flesh with a greenish, yellow or pinkish skin. The smallest citrus is the tiny, orange oval kumquat, which originated in the east but is now grown mainly in Brazil. The fruit has distinctive sweet sour flavour, the sweetness is especially evident in the rind and kumquats are usually eaten unpeeled. They are deliciously fresh, but may also be candied. This specialty fruit is a cross between a tangerine and a grapefruit. (The name comes from pomelo, the European term for grapefruit.) The fruit is fairly large, with an easy-peeling rind and few seeds. The deep orange flesh is best when peeled and eaten out of hand for lunch or snacks, but it also can be used for juicing.